In Bending Water and Stories Nearby, author Pete Wurdock has infused new life into the literary landscape with a collection of short stories. These stories are reminiscent of the pioneering narratives of Hemingway’s Nick Adams stories, avoiding the pitfalls of the derivative by plotting a course through the rough, unpredictable, and often isolated terrain of Michigan’s natural splendor. Bending Water and Stories Nearby is populated with characters wrestling with emotive realization in a voice that is as equally fresh as it is contemporary. 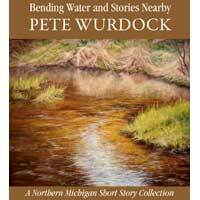 Author Peter Wurdock is a Michigan born writer who has just released a new collection of short stories that are all based in northern Michigan and the Upper Peninsula. Bending Water and Stories Nearby has only been out for a couple months and is already receiving great critical acclaim. This is Pete Wurdock’s second book written about Michigan. Bending Water and Stories Nearby is the only book of its kind that combines northern Michigan short stories with beautiful color artwork by Michigan artists.